Contact name: Mr Bill Offord, Hon. Sec. Burnham Overy Staithe is a small coastal village in one of the most attractive areas of the North Norfolk Coast, close to Burnham Market. Sailors, walkers and birdwatchers all enjoy this area immensely. The coast here is a series of creeks and salt marshes often with paths through to the sandy beaches beyond. Most of the coast is protected by the National Trust and other nature trusts, being in the heart of the designated Area of Outstanding Natural Beauty that covers much of the North Norfolk Coast. In the C17 and C18 this was an important destination for ships sailing up and down the North Sea. It was here that the Cringle family arrived in Norfolk from the Isle of Man; Captain William Cringle was skipper of one such ship carrying grain and other goods on these sea-routes round the British Isles, and for whatever reason decided to settle in Norfolk in the mid 18th century. His son carried on the family business of master mariner during his lifetime, and other relations had connections with the sea for many years. One was Captain of the packet boat London Trader and another famously sighted a sea serpent on the long voyage to Australia. 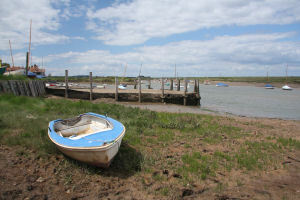 A private ferry runs from Burnham Overy Staithe (weather permitting) taking visitors to the National Nature Reserve on Scolt Head Island, managed by English Nature (EN Warden: tel. 01328 711866) and an important breeding site for four species of tern, oystercatcher and ringed plover. It is dangerous to walk over the saltmarshes and sandflats at low tide. Ferry, tel. 07776 302413. There is no formal buoyage or lights. Visiting yachts should be wary of stone-built groynes sticking out into the creek. Shoal draft boats that can take the ground may be able to borrow a mooring near the boathouse: check at the boathouse chandlery (01328 738348). Facilities available in Overy Staithe are limited to the chandlery and a pub. Provisions, diesel and a more exotic range of shops are to be found in Burnham Market (2 miles). The channel inside Scolt Head Island to Brancaster Staithe (Norton Creek) is navigable at high water for shoal draft boats.